This example shows how to generate data using a National Instruments device available to MATLAB® using the Session based interface. To discover a device that supports analog output voltage subsystems, click the name of the device in the list in the Command window, or access the device in the array returned by daq.getDevices command. This example uses a National Instruments CompactDAQ device NI 9263 with ID 'cDAQ1Mod2' representing the module in slot 2 of Chassis 'cDAQ1'. This module is in slot 2 of the 'cDAQ-9178' chassis with the name 'cDAQ1'. Use the daq.createSession function to create a session associated with a vendor. The session contains information describing the hardware, scan rate, duration, and other properties associated with the generation. When you create a session, assign it to a variable. 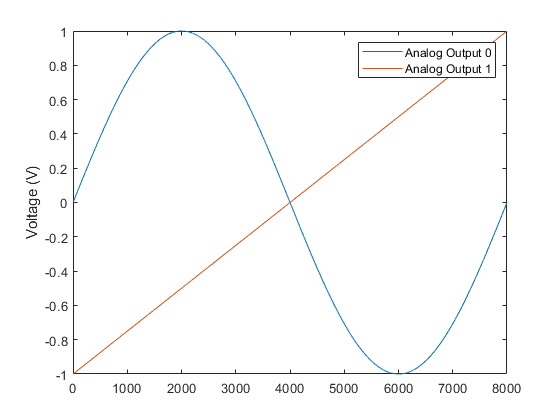 Use the addAnalogOutputChannel function to add two analog output channels from this device to the session. By default the session is configured for 1000 scans/second. Change the scan rate to acquire at 8000 scans/second. No data queued. Will run at 8000 scans/second. Use the outputSingleScan function to generate a single scan. The data is a 1-by-N matrix where N corresponds to the number of output channels. Here you output 2V on each channel. Use the startForeground function to start the analog output operation and block MATLAB execution until all data is generated.